• Full registration ($220 each) – Limited to 115 and includes festival meals (Thursday Meet and Greet refreshments, Friday lunch, Saturday dinner, Sunday refreshments), all souvenirs, workshops and programs. Full registrations received after 115 are filled will be given the option to purchase partial registrations and be put on the waiting list for full registration. • Partial registration ($180 each) – Limited to 15 and includes everything except the souvenirs. Partial registrations received after 15 are filled will be give the option to purchase meals only registration and put on the waiting list for partial registration. • Meals only registration ($150 each) – Limited to 15 and only includes festival meals (Meet and Greet refreshments, Friday lunch, Saturday dinner, Sunday refreshments). Meals only registration received after 15 are filled will be put on the waiting list. • Registrations must be received by May 15, 2018. • Cancellation requests must be received by May 30, 2018. No refunds will be given after this date. Hotel The festival will be located at the Crowne Plaza AiRE MSP Airport – Mall of America. • The room rate is $129 per night and includes breakfast each day for up to 4 guests per room. o NOTE: You must indicate how many will be staying in the room with your reservation to receive the tickets for breakfast. 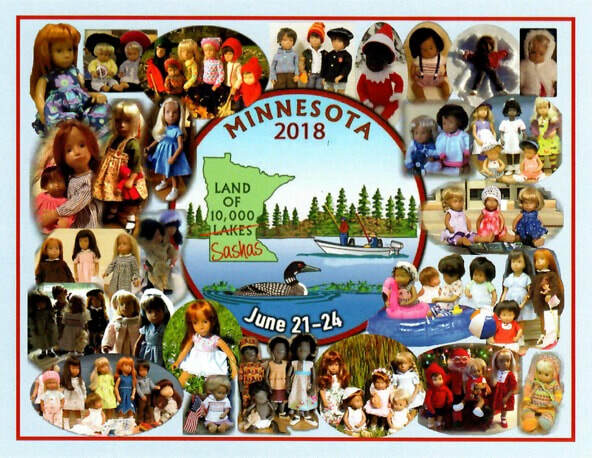 • Reservations can be made by calling 952-854-9000 or toll free 1-800-227-6963 and referencing Sasha Doll Festival. • Online reservations can be made by clicking on this link: Sasha Doll Festival. • Rooms must be booked by May 15, 2018. • The hotel provides a complimentary shuttle to and from the airport and Mall of America. Go to http://www.crowneplazaaire.com/ for more information on the hotel. Children’s Fund Auction (CFA) The Children’s Fund Auction (CFA) raises funds for local, national and international children’s charities in the name of Sasha Morgenthaler. Please follow the below directions if you will be donating an item to the auction: • Send a picture and description of your item(s) to Sasha.Festival@outlook.com by May 15, 2018. Helper Tickets NEW – We are offering you the opportunity to purchase Helper tickets in advance with your registration. You can buy 40 tickets for $20. Dress a Sasha Contest Our theme this year is “A Doll for All Seasons”. Use your creativity to show your dolls enjoying your favorite season. Keep in mind that seasons can mean many things – spring, summer, winter, fall, opera, baseball, etc. We look forward to your display! • NEW – once the Dress a Sasha displays are set up they will remain up through Saturday evening. More time to enjoy everybody’s hard work! IMPORTANT!! Each Entry space should be NO LARGER THAN 18 inches by 18 inches with a LIMIT OF THREE (3) DOLLS. Please include an index card with a brief description and/or title of your entry (please remain anonymous and do not put your name on your card or your display). Table Hostess Table Hostesses are needed for lunch on Friday and dinner on Saturday. • All volunteers for hostesses are welcome but hostess under age 15 must be accompanied by an adult assistant If you are interested in being a table hostess, please make the appropriate section on the registration form. Margie Richards will be managing the table hostesses this year. If you have any questions please email her at margndavi@aol.com. Sales Tables A limited number of sales tables are available for purchase. The items for sale should be Sasha related (dolls, clothing, accessories, memorabilia, etc.). Tables are available to all registrants for a fee of $20 per table. To ensure everybody has the opportunity to purchase a table we are setting a limit of one table per person. If you desire multiple tables you can request extras but will be put on a waiting list for any tables not sold. Tables may also be shared by registrants. The tables a 6’ x 3’ and will be covered. All items must fit within the table space due to safety restrictions put forth by the hotel. Other Volunteers We can always use other volunteers for some light duties (setting up helpers, helping with the auction, selling tickets, etc.). Please sign up on the registration form in you would like to help in any way. Gift Exchange The gift exchange is an optional but fun activity. The gift can be for any of the Sasha family (Sasha, Gregor, Baby, Toddler) and should be valued at around $15.00. You should bring your gift wrapped in tissue paper and include a card with your name, address and email so the recipient can thank you.